A peep hole is the best way to see through a front door without opening it. 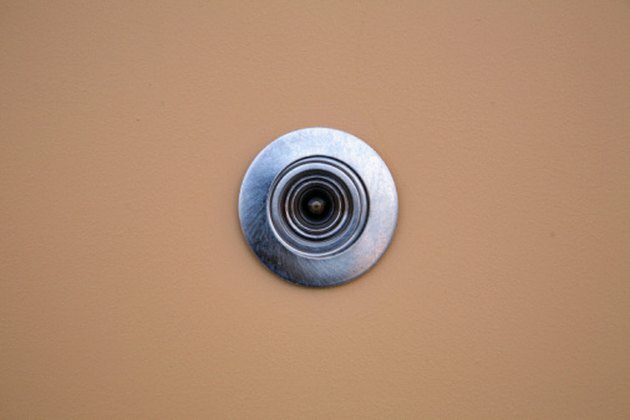 A dirty peep-hole blocks your view, and might be detrimental to your safety. Keeping a peep hole clean aids in keeping your home safe and secure. A peep hole allows you to see who is knocking at your door. Clean the interior side of the peep hole with a cotton swab soaked in glass cleaner. Clean the exterior side of the peep hole; use glass cleaner and a paper towel. Look through the peep hole to verify that there are no streaks or moisture on the lenses. Use more glass cleaner -- on a cotton swab or paper towel -- if streaks are evident. Use the low-heat setting on a hair dryer to eliminate moisture. Donald Fetzer has been writing professionally since 2008 and is a current college student at St. Petersburg College. Fetzer loves to get his hands dirty working on cars and specializes in writing how-to articles about auto repair.